Sweetie and Geek are in 100% agreement with the statement that it is never too young to read your child a book. Reading to babies and toddlers is very helpful to their language development. But, if you pick the right books, you can also sneak values and behavior lessons in there, too. Here is the list of the books that we have used to try and pass on our values to our little guy. This is not an exhaustive list. But, we still encourage you to add your favorite books in the comments section. We are sure there are many great books with many great lessons for toddlers and preschoolers out there that we don’t know about. Each of the books from this list includes an easy lesson that a toddler or preschooler can understand. After you read the book, ask your child to retell the story. If your child doesn’t hit upon the moral in the retelling or is fixated on some other part of the story, try asking direct questions about the lesson. You will be surprised at how perceptive children are about what they hear. 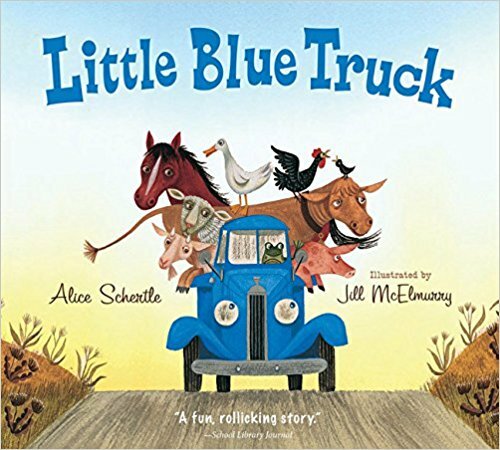 Little Blue Truck by Alice Schertle is a great book to start reading as early as possible. I intentionally would not specify the age because there is no too young for reading books. This book has great catchy rhyme, many repetitive sounds, plus a lot of animal noises and other onomatopoeia for the very young to get excited about. The illustrations are detailed enough to encourage vocabulary-building “what’s that” questions but they are not so overwhelming that they drown out the story (like a Richard Scarry book). The story is about a friendly little blue truck and a self-important dump truck. When the dump truck needs help, only the friendly little blue truck is willing to step in. While when the little blue truck needs help every other character from the story jumps in. Room on the Broom has great rhythm and amazing illustrations. It’s fun to read even when you don’t think too hard about the message. No wonder it is so popular. The book’s message is about the importance of friendship, meeting new people, and being helpful to strangers. The witch and her cat meet a whole crew of helpful other animals one at a time while they are out for a fly on the witch’s broomstick. 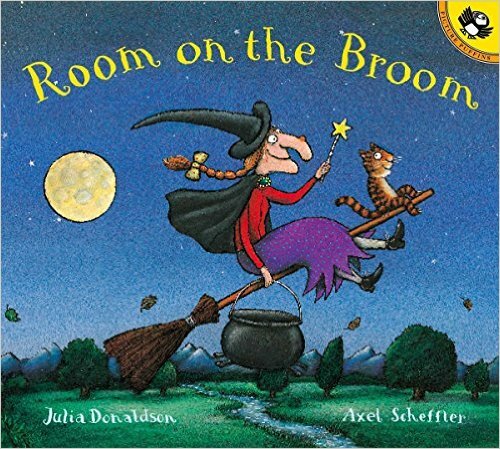 New friends team up to help the witch avoid being eaten by a dragon and she solidifies their friendship in the fun magical creation of a new accommodating broom. There is a delightful video rendition of the story available online (Netflix has it) where the witch’s cat behaves skeptically toward the witch’s welcoming spirit, at first. Friendship is important. There is no such a thing as too many friends. A good friend always shares. 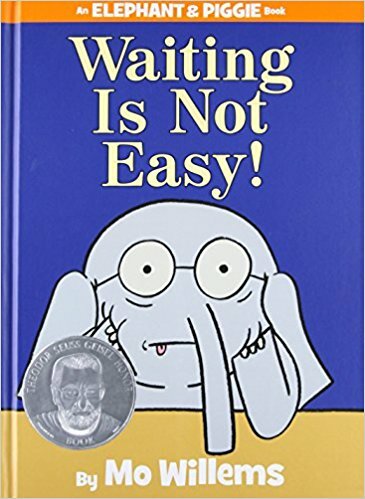 “Waiting is Not Easy” is a book in the Elephant and Piggie series. These books are sometimes silly, but a majority of them contain good lessons for kids. The text is simple and characters speak via voice bubbles. Thus, early-readers should be able to handle the books, although they are hysterically funny to toddlers and preschoolers. In case it wasn’t obvious from the title, the lesson in “Waiting is Not Easy” book is about patience. Piggie has a surprise for Gerald, but he is going to have to wait for it. And Wait. And wait some more but the payoff is great. Waiting is not easy, but sometimes it is necessary to wait for great things. 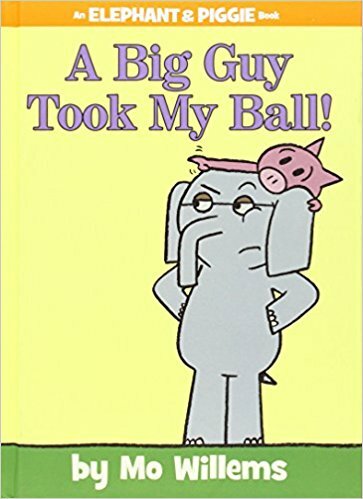 “A Big Guy Took My Ball” is another great book for toddlers and preschoolers from Elephant and Piggie series. This adventure starts with Piggie telling Gerald a story. She found a ball, a big ball. It was the best ball ever. She was having so much fun until a “big guy” came and took “her” ball. It was AWFUL. Piggie is outraged. Gerald is a friend, a good friend. If someone has picked on Piggie, he should do something to help, right?! Gerald was perhaps expecting a “big guy” around his own size…or at least closer to his own size. He wasn’t expecting a HUGE WHALE. But what Piggie and Gerald discover is a very large, but sad whale. The whale is polite and friendly as he explains the misunderstanding. The book teaches about misunderstandings and conflict. It teaches that you can think out of the box and find a solution that makes everyone happy. I also like that the book teaches kids not to jump to conclusions based on the appearances. 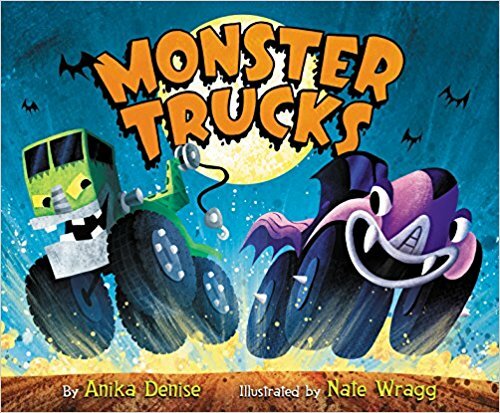 Monster Trucks by Anika Denise also teaches not to judge based on appearance but in an opposite way from the “A Big Guy Took My Ball” book. Anika Denise’s message to kids is that appearance can be deceiving. The book begins by introducing all the scary monster trucks who are then given a run for their money when they face off against a meek-looking little blue bus. In the end, we discover that the bus is not quite as she appears. We mostly enjoy this book for its fun rhymes, onomatopoeia, and vocabulary (STOMP, GRUMBLE, HOWL, GUMPTON, PLUCK), but there are two lessons to be learned. First, the classic effort-can-overcome-inherent-limitations moral. But, there’s also a reverse don’t-judge-a-book-by-it’s-cover lesson, in that the cute van might be the fiercest monster of them all. 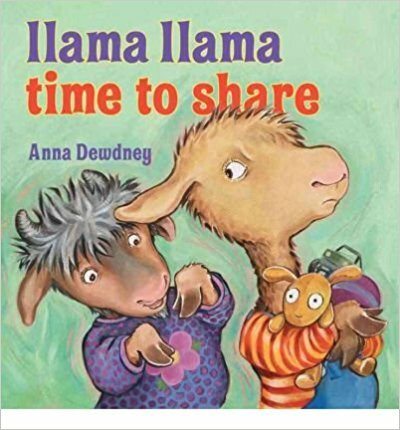 “Llama Llama Time to Share”, like most of Anna Dewdney’s Llama Llama series shows a real every-day situation in the life of a preschooler. All of these books offer great opportunities to talk about situations with your little one; so you will have some common ground to refer to when the situation eventually comes up. In this installment, Nelly Gnu, a new neighbor comes to play with Llama Llama. He really doesn’t mind sharing some of his toys, but his favorite stuffed llama? No way, and here is where the trouble begins. The mamas are wise, though, and soon little llama learns that sharing is vastly preferable to destructive conflict. My two-year-old son understood the idea right away. Of course, he doesn’t always share. But, sometimes you can get him to de-escalate conflicts over toys by reminding him about the book. Sometimes he even reminds himself and others by repleting the title of the book. Sharing is important in friendship. It is also important to find a compromise where everyone can have more fun. Llama Llama and his friends cannot enjoy their school day because Gilroy Goat is being a bully. 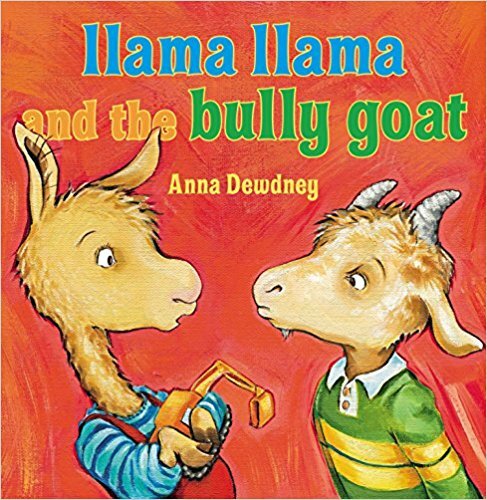 “Llama Llama and the Bully Goat” is very easy to understand for toddlers and preschoolers and it teaches children how to deal with bullying. Llama Llama and his friend put up a united front against the bully by leaving to tell an adult. The bully is reprimanded and friendly play resumes. This is a much more accurate portrayal of effective anti-bullying actions than cartoons and movies seem to show. The meme seems to be that the bullied individual needs to fight back somehow. But, bullying is best reduced by the group setting standards. Bullies are also not cartoon villains, either. Frequently, they just want to fit into the group, themselves, and will follow the norms of that group once they understand them.